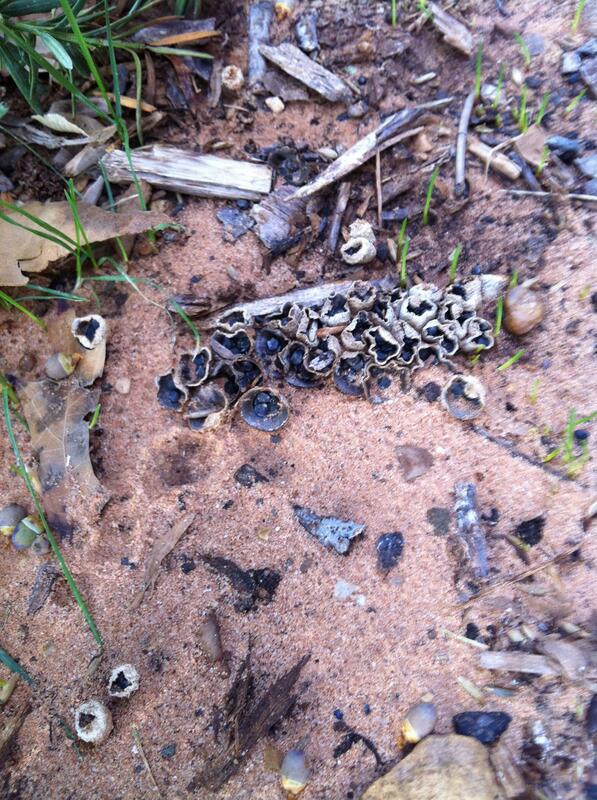 I have an array of several different types of mushrooms popping up in my fescue. There are not enormous areas covered, the largest collection is about an 8-10 inch circle. The rest are small groups scattered about the yard, or solo. Is this anything to be concerned about? 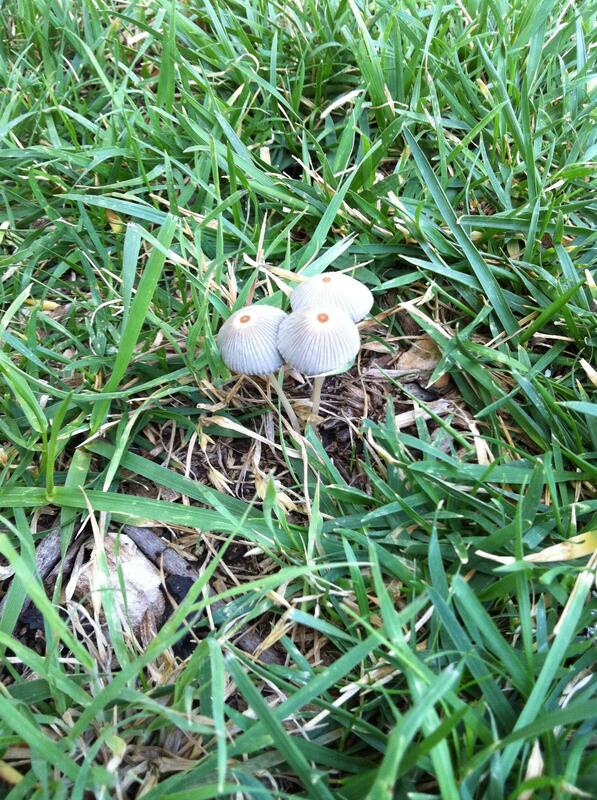 Mushrooms, or toadstools, are usually caused by decaying organic debris, such as pieces of wood and dead tree roots, just below the surface of the lawn; they can also be caused by a thick layer of thatch (the layer of grass clippings, dead roots etc that accumulate on the surface, just below the grass line - see here), and they thrive in damp conditions. Given that there aren't many of them, and they don't seem to be the type that forms rings that grow wider and wider every year, I don't think you should be too worried; you may find them a bit unsightly, but they are not likely to cause much damage. If you're concerned about the 8-10" circle, you could lift that small piece of turf, remove whatever decaying matter is underneath, and replace it. As far as I'm aware, there is no reliable water-on technique for ridding a lawn of toadstools; you could try iron sulphate (1/2oz in a gallon of water per square yard), but it doesn't always work and, when it does, sooner or later, the mushrooms often return. A thorough dethatching (or'scarifying'), on the other hand, might well do the trick - see Thatch Control here. 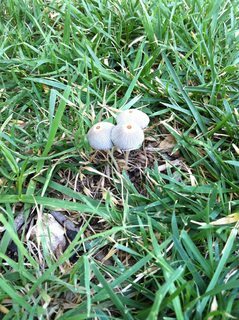 There is a good article about toadstools/ mushrooms in lawns here. 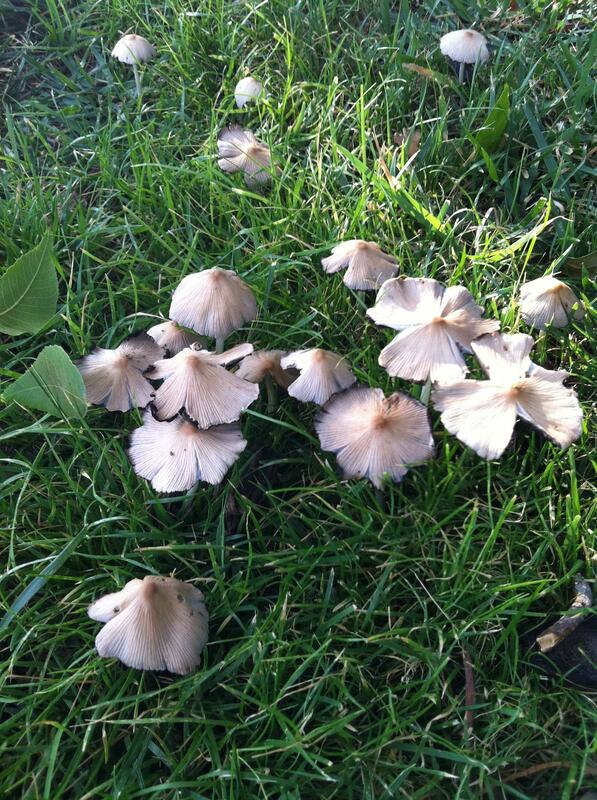 There appears to be wooden pieces within your lawn, is there a reason for that? Does your lawn drain well? Have you recently had a lot of rain fall? Dead, rotting wood is an ideal material for mushrooms (fungus) to grow on/in, especially if that area also happens to be moist (damp). From comments below: I think the wood pieces may be remnants from the mulch in the flowerbed nearby...or possibly from when they ground the stump in the tree that is also nearby. There's not a lot of it in the lawn though. If you follow the link given above, you will see that the tree stump and roots were left in the ground, therefore there's "plenty" of dead, rotting wood under the lawn. As a general rule of thumb, a tree's root system spreads out as far as the very edge of the tree's canopy. From comments below: There hasn't been much rain since Oct 2010, in fact we're in a drought. However, I water twice a day to keep my fescue from drying up and blowing away, so the ground is moist. Cool-season lawns require 1inch (25mm) of water a week to remain healthy & should be given in either one deep watering a week or two ½inch (12.5mm) waterings. More details can be found here. Removal of the tree (stump & roots were left in the ground), as I stated previously (refer to above "Additionally" comment). Your twice daily lawn watering practices. Those two conditions combined make an almost perfect mushroom growing environment (IMHO). I get this question all the time at the garden center that I work at. There is nothing to be concerned about with mushrooms growing in your lawn. The only reason they are there is to decompose some form of organic matter. When they have done their job, they will go away. Trying to get rid of them usually proves futile. They always come back. As long as they are not poisonous, you should be ok. Even if they are poisonous, you have very little to worry about unless you or a pet eats them. If you're watering in the evening, try switching to early morning (much easier with a programmable sprinkler system). Watering in the evening can leave your soil too moist for too long, which encourages fungus growth. With morning watering, the daytime heat will help to evaporate some of the moisture, and discourage toadstools and various other fungi that can actually harm your lawn. HTH. Not the answer you're looking for? Browse other questions tagged lawn fescue or ask your own question. 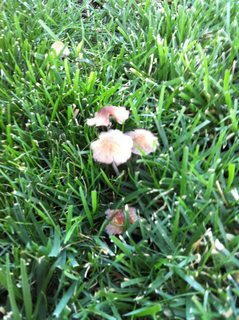 What to do about fungus in lawn? How can I tell if my lawn needs to be dethatched? 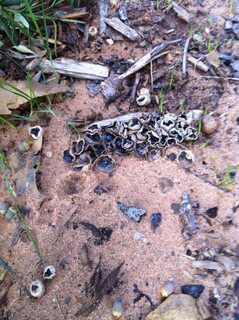 Mushrooms in mulch: that's OK, right? What should I do about a dead lawn and weeds in California? What should be done about automotive fluids killing grass? Should I be concerned about this weedy grass popping up in my lawn? Should I roll after seeding lawn? What kind of seed is most suitable for my lawn?